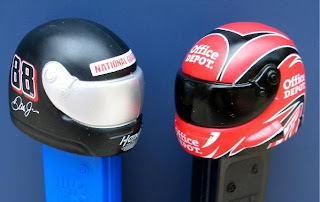 Two new NASCAR PEZ are just released. 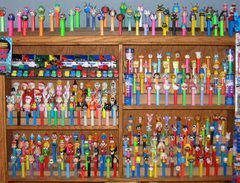 DALE EARNHARDT was just released last year (on a red stem - see post of July 3, 2007). But that wiley Dale soon changed sponsorship to the 'National Guard' and 'Hendricks Motorsports' which are now printed on his black with special silver visor helmet. CARL EDWARDS is new for 2008 - black stem, 'Office Depot' on the helmet. After we got the Dale Earnhardt and Jimmie Johnson 2007 releases on Ebay they were seen and could have been obtained retail at Walmart. So keep your eyes out . The new PIRATES OF THE CARIBBEAN set is supposed to out now. Keep your land-lubber eyes pealed maties. And remember to keep on the look-out for BRUCE THE PIXAR SHARK and FAIRIES . They should have been out for a couple of months. In honor of the June Birthday couple, Jason and Stefanie, a donation of 3 Limited Edition PSYCHEDELIC EYEs have been made. These are a 'retro' edition of an old series. There are dozens of combinations of colors produced.